Highly drafted catchers who can hit and play defense come around less often than playoff games at Camden Yards—which is why Baltimore has built a suddenly promising future around Matt Wieters. No two ways about it: The Orioles are sitting on the most sought-after commodity in the game. The pile of paper crumpled high on the table caught the attention of Orioles president Andy MacPhail as soon as he entered the Baltimore clubhouse one afternoon last summer. Sitting around the table were several young Orioles, a group that included catcher Matt Wieters, 23, and pitchers Chris Tillman, 21, and Brian Matusz, then 22. "Derek Jeter!" one of them said. As MacPhail drew nearer, he understood what was happening. His players, the rebuilding blocks of a once-proud franchise, were tearing through packs of baseball cards and delighting at the occasional premium find. Wieters himself is a gem, having ripped through just 169 minor league games between his selection with the fifth pick of the 2007 draft and his big league debut last May, an event so big in Baltimore that the Orioles announced it three days in advance and Camden Yards filled with more people than at the previous three games combined. The fans greeted him with a standing ovation before his first at bat. "The ballyhoo for Matt Wieters has been unlike what I've seen before except for Mark Prior," said MacPhail, who was running the Cubs when Prior, the pitcher drafted second overall in the 2001 draft, made his big league debut the following year. "Seeing those guys opening baseball cards was a little reminder about keeping perspective. Matt is still just a young kid in this game." This spring the searchlight for the Next Big Thing has shined most prominently on outfielder Jason Heyward, 20, of Atlanta, who is such a dangerous hitter the Braves have considered erecting nets to protect cars in the employee parking lot at their training complex from his home run bombs, and pitcher Stephen Strasburg, 21, of Washington, who quickly was dubbed Jesus by a teammate because of expectations that he is the franchise savior. But in Wieters, a switch-hitting, 6'5" young catcher, the Orioles are holding a cornerstone who invokes an even higher power: His teammates at Georgia Tech called him, simply, God. SI's fearless NFL expert opines on all the latest news, buzz and inside information. This is just a taste. Ace pitchers and power-hitting outfielders come along often enough to make the Next Big Thing commonplace, but the most recherché genus in the game—the equivalent of a T206 Honus Wagner baseball card—is the good-hit, good-field young catcher. It's what makes Joe Mauer of Minnesota, still only 26, so valuable. "I would agree there are fewer top catchers than aces," said Mike Arbuckle, senior adviser for scouting and player development for the Royals. "I don't think you can count more than 10 legitimate frontline catchers. A lot of clubs have average guys catching every day." Catcher is the worst-hitting position, by OPS and batting average, in the major leagues. Only four catchers last year had an OPS better than the overall major league average (.751) with enough plate appearances to qualify for the batting title: Mauer, Victor Martinez of Boston, Brian McCann of Atlanta and A.J. Pierzynski of the White Sox. Good catchers are so hard to find that teams routinely swing and miss when it comes to selecting catchers even at the top of the draft. Of the 420 players taken among the top 30 picks in the past 14 drafts, only one pick has managed to catch even 100 games in the big leagues so far: Mauer, the No. 1 selection nine years ago. And that is why Wieters is Baltimore's rare bird. Once known as Mauer with Power (before Mauer slugged 28 homers last year), Wieters is the seldom-seen catcher with the all-around game to be a franchise player. As MacPhail put it while trying to stay subdued, as if wearing oven mitts to handle the hype, "If we're fortunate enough to have a durable, switch-hitting catcher who handles a pitching staff, throws out runners and hits in the middle of the lineup for years to come, we'll have something any club would love to have. And nothing indicates that he can't be that kind of player." Yet the Orioles still gave an 11th-round draft pick last year, high schooler Michael Ohlman, $995,000—late first-round money. Why? "He's a catcher," MacPhail says. "Obviously the demand far exceeds the supply." 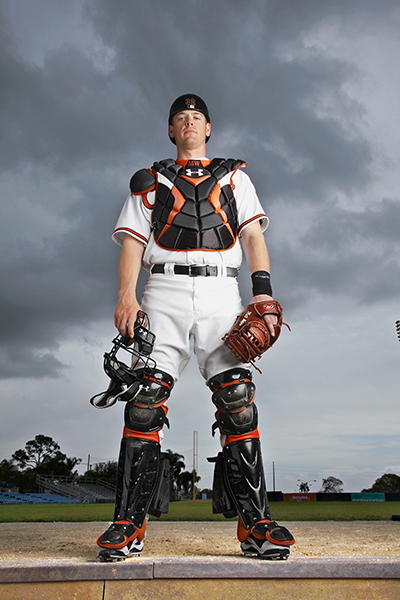 Wieters has all the tools to become that rare impact catcher, especially his patience and power at the plate. His minor league numbers (.343, 32 homers, 121 RBIs in those 169 games) were so dominant that the 2009 PECOTA forecast system of Baseball Prospectus added to Wietersmania when it spit out an MVP-caliber projection for a first-year player: .311, 31, 102 with a .939 OPS. Wieters wound up with a respectable .753 OPS as a rookie in 96 games. He hit only nine home runs, but they were enough to highlight his power to all fields: two were hit to the opposite field, three to the pull field, and four to center. His hitting prowess from both sides of the plate fits the profile of Boston's Martinez. Wieters has a stronger throwing arm than Martinez—he threw out the speedy Carl Crawford twice in the same game last September—though his footwork and agility need improvement, as might be expected from such a tall, wide-shouldered backstop. To live up to expectations, the 230-pound Wieters will have to overcome the brutal washout rate of highly drafted catchers, the physical toll of the job and the temptation of the occasional double cheeseburger with fries. 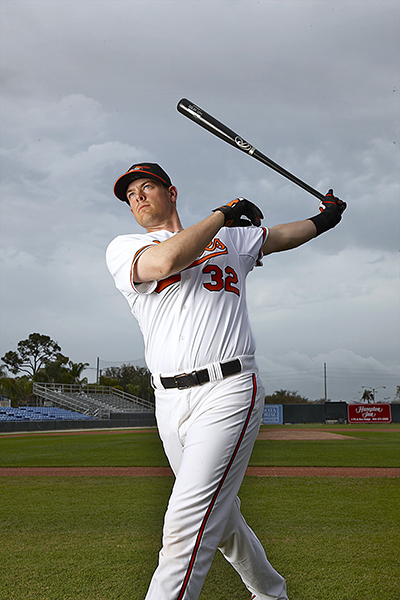 Wieters reported to camp this spring having cut his body fat by 5% by making an effort to eat healthier. "The biggest difference," Wieters says, "is when you actually get up to the drive-through window and say, 'I'll take the grilled chicken,' and go from there." Like Mauer, whose grandfather, a onetime White Sox minor leaguer, groomed him to be a lefthanded hitter, Wieters was encouraged to hit from the left side at an early age. His father, Richard, a former minor league pitcher for the Braves and the White Sox, began to work with Matt at age five on catching and switch-hitting at their home in Goose Creek, S.C. "He got me to turn around and swing from the left side," Wieters says. "He said, 'If you like it, keep doing it. You're going to really like it once they start throwing breaking balls.' And that's when I really did like it." The father and son would play a guessing game whenever they watched games on television together. "We'd guess which pitch was coming next and see which one could get it right," Wieters says. "I liked catching right away, because if I had to play short or first, I wasn't in on every play. Catching can keep you sane. You can go 0 for 4 at the plate and still feel like you had a pretty good game because of all the responsibilities on defense." Matt pitched a bit himself, even in his three seasons at Georgia Tech, where he nailed down 16 saves with a mid-90s fastball. In one game as a freshman at Miami, Wieters hit a two-run homer in the top of the ninth to put the Yellow Jackets ahead, then pitched the bottom of the ninth for the save. On that day, the God nickname was bestowed. "Matt told me there were times he'd catch the eighth inning," Orioles manager Dave Trembley says, "and then go to the bullpen to warm up—with his shin guards on. If they took the lead, he was coming in to close. If not, he would go back and catch. Imagine that." Represented by Scott Boras, Wieters slipped to the Orioles with the fifth pick of the 2007 draft but still came away with the biggest bonus given that year ($6 million), even more than the No. 1 pick, pitcher David Price of Tampa Bay. The Pirates, with Wieters still on the board at No. 4, took the more signable Daniel Moskos, a lefthanded pitcher out of Clemson. They saved $3.525 million. Moskos turns 24 next month and has a 4.61 career ERA in the minors. The Orioles were thrilled with their good fortune. The franchise has never had a Gold Glove catcher and hasn't had an All-Star backstop since Mickey Tettleton in 1989. Then again, Wieters faces this daunting track record: Over the past quarter century only two top five picks have made the All-Star Game as a catcher: Mauer and the Phillies' Mike Lieberthal. "Why did Ben Davis fail?" asks Milwaukee G.M. Doug Melvin, referring to the second overall pick in 1995, who bounced among seven organizations and hit .237. "It's something of a mystery what happens with catchers. But it's like quarterback in the NFL. They are so hard to find that the tendency is to overdraft them." "I've had no success drafting catchers," said Arizona G.M. Josh Byrnes, a former assistant to Red Sox G.M. Theo Epstein. "I remember my last [off-season] in Boston, when our free-agent class was going to include David Ortiz, Nomar Garciaparra, Pedro Martinez, Derek Lowe and Jason Varitek. We felt like Varitek was the Number 1 priority because the position made him the hardest guy to replace." Says Arbuckle, "I see a couple of phenomenon at work. One is that kids don't want to catch today. Kids grow up in a softer environment. It's just too much work, too dirty and too hard. "The other is that if they can hit, they're not very good receivers. A lot of kids are good receivers, but can't hit. Finding a guy who plays on both sides of ball is extremely tough." Arbuckle said that "softer environment" has increased opportunities for Latin American backstops. "So many of the Latin kids want to get to the big leagues and they don't care how," he says. "Many of them have more to lose than an American kid who has a job waiting if baseball doesn't work out." The big leagues are stocked with starting catchers from Puerto Rico (Bengie and Yadier Molina, Jorge Posada, Ivan Rodriguez, Geovany Soto), Venezuela (Martinez, Ramon Hernandez, Miguel Montero, Dioner Navarro), the Dominican Republic (Miguel Olivo) and Panama (Carlos Ruiz). Two of the three best prospects (other than San Francisco's Buster Posey) are from the Dominican (Cleveland's Carlos Santana) and Venezuela (the Yankees' Jesus Montero). "We grew up watching Benito Santiago, Sandy Alomar and Pudge Rodriguez," says Jose Molina, "and said, 'We can be like them.' My dad told me it's the best way to get to the big leagues." Then Molina, 34, a career .235 hitter now playing for Toronto, his fourth organization, smiled and added, "And it's the best way to stay in the big leagues." No position values experience quite like catching, and a down cycle of young catchers has kept older backstops working. None of the first 102 World Series champions had a catcher older than 34 who caught more than 75 games. But it's happened twice recently: 35-year-old Varitek of the 2007 Red Sox and 37-year-old Posada of the '09 Yankees. There have been as many 35-and-older regular catchers in the past three seasons (seven) as there were between 1953 and 1982 (minimum 100 games). This winter alone, in a game of musical chairs among older, offensively-challenged catchers, free agents Josh Bard, 31; Brian Schneider, 33; Jose Molina, 34; Rod Barajas, 34; Jason Kendall, 35; Chris Coste, 37; Mike Redmond, 38; and Rodriguez, 38, all changed teams without the benefit of an OPS better than .663. Melvin signed Greg Zaun, 38, to be the Brewers' eighth starting catcher in the past 10 years. None of them have been younger than 29, and none of them have been homegrown. "I was in Baltimore when we drafted Zaun," Melvin said, "and 20 years later here I am signing him again." Zaun held Wieters's place for him last year in Baltimore until the kid was done demolishing minor league pitching and debuted May 29. Wieters began with just four hits in his first 28 at bats—his first was a triple—but hit .301 in 88 games thereafter with nine homers and 43 RBI. He joined McCann, Russell Martin, Mauer, Kendall and Rodriguez as the only 23-and-under catchers over the past 20 years with 100 hits in a season. "The biggest thing I learned is you can't do too much," Wieters says. "The ball can look so good and the crowd can get you pumped up so much that you try to hit the ball 550 feet every time. Well, there's a reason guys can't do it every time. The key is to catch yourself and dial it back and be nice and smooth. "I had to figure that out the first month. There was a lot of pressure, not so much to meet expectations but you just feel like you can hit a home run every time." 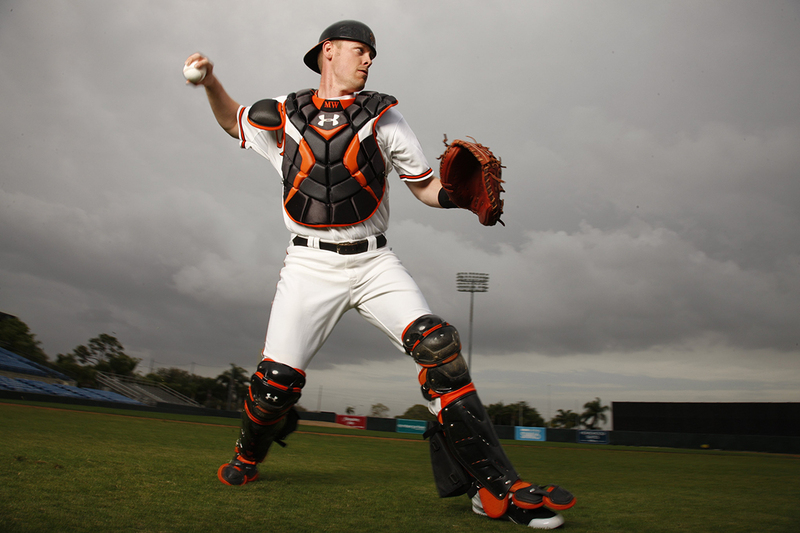 This is Wieters's third spring training, but his first as Baltimore's starting catcher. "Not so much eyes wide open now," he says. "Now it's take control of the pitching staff and get as prepared as you can, as well as pump up the position guys and say, 'O.K., it's time now, guys. We've got the talent.'" Baltimore hasn't had a winning season since 1997, the year Wieters turned 11 years old. Now it is his job, his time and perhaps even his team. If they are right about Wieters, the Orioles will be a step closer to a franchise turnaround. Imagine that: a young catcher lifting Baltimore into a pennant race. Rarities abound. Wieters is so talented that teammates at Georgia Tech began calling the catcher God.